A beautiful wintery version of sangria featuring apples, pears and pomegranates with a hint of nutmeg and cloves. Perfect for a Christmas or New Years party! 1 teaspoon ground nutmeg fresh makes ALL the difference here! Combine pears, apples, cloves and nutmeg in a large pitcher. cover with white wine. Refrigerate for 24 hours. Fill a champagne flute half way with the fruit/wine mixture. 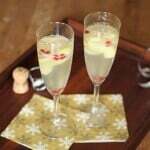 Top with champagne and several pomegranate seeds.